With about 50,000 residents at last count, San Isidro de El General is a hub of activity in southern Costa Rica. Amenities include supermarkets, banks, a movie theater, and all types of stores, with locals from neighboring communities visiting frequently to stock up on the essentials or for a night out on the town. A growing expatriate community resides in the mountains throughout this scenic area, making it easy to spark new friendships in this remote-feeling place. The icing on the cake may be the fact that beautiful beaches are as close as a half hour's drive away. Most people who invest in the San Isidro de El General area find their little piece of heaven in the mountains surrounding the town. 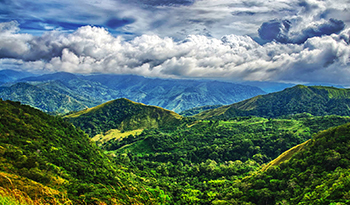 Investing in Costa Rica is more affordable here than in many other, more developed areas of the country, yet there's no lack of perks to calling San Isidro de El General home. From luxury homes on rolling hillsides to vacation rentals in modern, yet unpretentious gated communities, there is an abundance of San Isidro de El General real estate for you to consider. Ocean views and mountain views are both possible, often on the same property, making it a swoon-worthy spot for vacation, to purchase a second home, or to retire in Costa Rica. 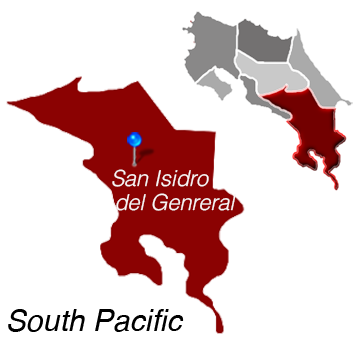 San Isidro del General is Located in the South Pacific.